Our latest project is in Seal Beach. Due to the proximity to the Pacific Ocean, the deck has some major leaking issues. This tile deck leaks into garage, the sub-floor is rotted and the flashing is rusted. Bad, bad news…but, not the only news. With Prestige Deck Coating on the scene, good news follows in suit. 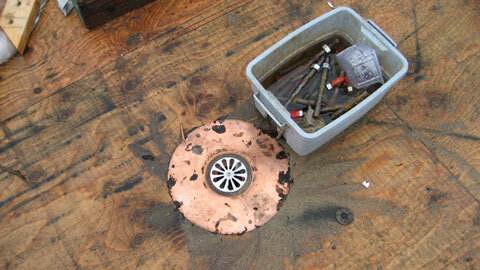 Water damage, soft spots, bubbling, dry rot, and leaking are not the last word. Our deck repair Seal Beach contractors are committed to waterproofing your decking! Wood Repair. We are removing the existing coating and deteriorating plywood, and then re-installing 3/4 inch plywood sheeting to build a solid foundation for our 5 layer Crete Deck Waterproofing System. Stucco Repair. The bottom 8 inches of the stucco is being removed and replaced to prepare for installation of the Diato ‘Combo’ metal. Flashing Repair. This is being installed along the deck to wall transition and incorporates the stucco screed. This is to make sure the wall will be ready for stucco when we are done. Proper flashing installation is crucial to achieving a waterproof seal. Prestige Deck Coatings is keen on attention to detail with this deck repair Seal Beach. We will complete our flashing deck repair Seal Beach project by installing a 1 two piece metal flashing door pan and one 2 inch Copper Thunderbird Brand deck drain. We have all the angles covered for all your deck coatings. Deck Repair System. We will be installing The Crete Decking System. This is a multi-layer waterproofing membrane designed for use over plywood sub-floors. Metal mesh. Staple down 2.5 galvanized metal diamond lathe. Powerful Polymer. 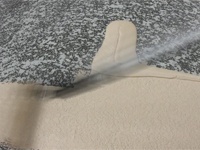 Trowel down cementitious base coat with a Desert Brand polymer additive. Fresh Fiberglass. Laminate using fiberglass matting & Desert Brand acrylic resin (Bonder 480). Cement Sensation. Trowel down an extra layer of our cementitious base coat. Tantalizing Texture. Spray texture coating (Smooth/Knockdown/Orange peel). Pretty Paint. Seal using fortified concrete paint. Deck Repair Seal Beach is no barking matter with Prestige Deck Coatings! We offer a 10 year warranty and free estimates. Give us a call today and welcome the rain!